A thigh contusion is also known as a dead leg or charley horse and is caused by direct trauma to the muscle. Symptoms include pain at the time of injury, restricted movement and inability to run properly. Or with more severe contusions even walking may be difficult. Depending on severity, swelling may develop quickly, and later bruising may or may not appear depending on the type of injury sustained. Thigh contusions can range in severity from very mild which is hardly noticeable at the time to severe disabling injuries where the athlete is unable to walk. Like muscle strains, contusions are grade 1, 2 or 3 depending on how bad they are. Grade 1 contusions will feel tightness in the thigh, the patient may walk with a limp. There is unlikely to be much swelling. Trying to straighten the knee against resistance probably won’t produce much pain and the patient will still have nearly a full range of motion when stretching the muscle. Grade 2 the patient is unlikely to be able to walk properly. There will be occasional sudden twinges of pain during activity, possible swelling and straightening the leg against resistance reproduces pain. Pressing in over the site of injury will be painful and the patient will be unable to fully bend the knee. Grade 3 contusions mean the patient will be unable to walk with the aid of crutches. They will be in severe pain and significant swelling will appear immediately. Contracting the muscle may produce a visible bulge or gap in the muscle. Expect to be out of competition for 3 to 12 weeks. Although a dead leg or charlie horse can often seem a minor injury it is important the correct diagnosis is made as failure to treat them properly can lead to long-term injury or permanent damage to the muscle. If heat or massage is applied too early Myositis Ossificans or bone forming within the muscle. Skeletal muscles are made up of bundles of muscle fibres. 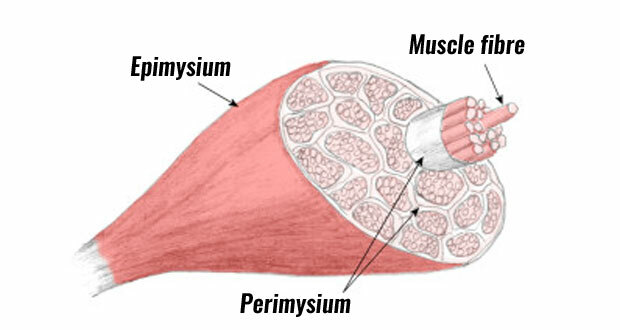 The muscle is surrounded by a protective sheath called the Epimysium. 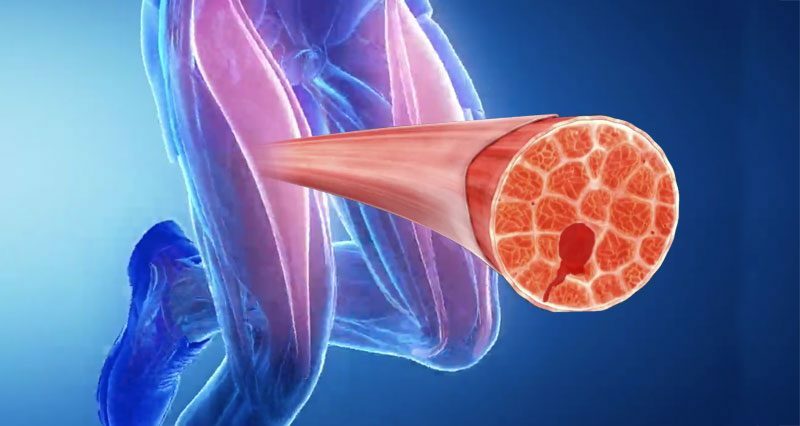 A thigh contusion is caused by a direct impact or trauma to the muscle which crushes it against the bone underneath, causing internal bleeding in the muscle. Contusions are either intramuscular or intermuscular depending on whether the bleeding is contained within the muscle sheath, or whether the sheath is also damaged and the muscle bleeds outside the muscle sheath. Intramuscular hematoma is a tearing of the muscle within the sheath that surrounds it. This means that the initial bleeding may stop early within hours because of increased pressure within the muscle, however, the fluid is unable to escape as the muscle sheath prevents it. The result is considerable loss of function and pain, which can take days or weeks to recover. You are not likely to see any bruising come out with this type – especially in the early stages. Intermuscular hematoma is a tearing of the muscle and part of the sheath surrounding it. This means that the initial bleeding will take longer to stop, especially if you do not ice it. However, recovery is often faster than intramuscular as the blood and fluids can flow away from the site of injury. You are more likely to see bruising come out with this one. If after two to three days the swelling has not gone, then it is probably an intramuscular injury with the bleeding contained within the muscle. If the bleeding has spread and caused bruising away from the site of the injury then it is probably an intermuscular injury. If it is an intermuscular injury then the patient will have greater movement and ability to contract the muscle. We recommend seeking professional advice before starting any rehabilitation program. The aim of rehabilitation of a thigh contusion is to control the initial pain and swelling, maintain and improve flexibility, restore muscle strength and gradually return to full fitness. Regardless of how bad the injury is the PRICE principles of protection, rest, ice, compression and elevation should be applied as soon as possible. Apply a cold therapy and compression wrap immediately. Ice can be applied every two hours for 10 minutes for the first 72 hours for more severe contusions. This will help stop any internal bleeding and reduce pain and swelling. Wear a compression bandage or thigh support to protect the injury and help reduce swelling. Elevating the limb allows swelling and tissue fluids to drain away from the area. It is very important to apply cold and compression to a contusion. Applying heat or deep massage in the acute stage may cause further injury or lead to myositis ossificans which is a bony growth within the muscle. Gentle stretching if it is not painful – hold for 30 secs, repeat 5 times daily. This may be started after the initial acute stage – usually 48 hours. From day four (no earlier – and it may be longer in severe injuries) apply heat (hot water bottle, hot baths, see a specialist for ultrasound). A professional therapist can apply sports massage techniques to speed up recovery but ONLY once the acute phase has definitely passed. Heat treatment and massage can cause serious muscle damage if performed on an acute contusion. Use of ultrasound and electrical stimulation may also be beneficial. Although the athlete is likely to be back to normal training within a few days for a grade 1 or mild quadriceps contusion, it is a good idea to develop stretching and strengthening exercises to ensure there is no long-term effect on performance. For a grade one contusion, strengthening exercises may be performed as soon as they can be done without pain. Start with the easier exercises on a daily basis and progress as soon as you feel comfortable onto the more difficult exercises which should be done three times a week. For a grade two contusion, it may be a week before strengthening is possible and a grade three even longer. All strengthening sessions should start with a gentle warm up and stretch and finish with a good stretch. Strengthening should continue for weeks after you feel the injury has healed. If the athlete is unable to continue with normal training, then swimming or cycling can be done instead, or if this is not possible work on the upper body strength. It is important to continue a training routine of some description. This is a gradual process. For a grade one contusion normal training may be resumed with a few days. It is important to maintain a stretching and strengthening program alongside training to ensure full strengthening and mobility of the muscle. Gentle jogging may be started and built up until the athlete can run comfortably for 40 minutes. Speedwork should be introduced gradually, for example: 10 x 60m at 50% of top speed, next session might be 10 x 60m at 70% top speed and so on. Below are examples of how the above fit into a rehabilitation program for a grade 1,2 and 3 contusion. Rest, Ice, Compress and Elevate (R.I.C.E.) immediately. Use a compression bandage or heat retainer until no pain is felt. Gentle quadriceps stretching – hold for 30 secs, repeat 5 times daily. Leg extension exercises – 4 sets of 10 repetitions 3 times a week. Gradually build up the weight to strengthen the quads. Ease down your training for a week or two but no need to stop unless there is pain. From day three, pain-free static quadriceps exercises (contract quads and hold for 10 secs in the sitting position). Improve mobility by bending and straightening the leg (as long as it is not painful). Apply heat (hot water bottle, hot baths, see a specialist for ultrasound). From day 7 do leg extensions (4 sets of 10 reps three times a week). Week 2: Pain-free static contractions ( if it hurts don’t do it). Heat with a hot water bottle, hot bath or ultrasound. Straight leg raises if pain allows. Use no weight and do 4 sets of 10 reps every day. Although a contusion may not appear to be a serious injury, the effects can be long lasting if rehabilitation is not taken seriously. Gentle quadriceps stretching exercises should begin as soon as pain allows after the first 24 hours. The emphasis should be on rest and healing rather than attempting to exercise too soon. However, once exercises can safely be done pain-free it is important to restore the muscle to its full mobility and strength. Strengthening exercises should only be done well after the acute stage. Static stretches should be done very gently to begin with where the stretch is held for a period of time. Later more advanced pnf type stretches can be done if there is a noticeable lack of flexibility in the muscle. Stand on one leg holding the leg to be stretched behind you. Pull the heel in towards the buttocks. Try to keep the knees together to avoid twisting the knee. Hold on to something if you need to balance. If you can’t feel a stretch, tilt the pelvis backwards to further lengthen the quads. Hold for 20-30 seconds and repeat 3-5 times. Stretch at least 3 times a day. Place the knee on the floor and the other foot on the floor in front of you. Push your hips forwards, keeping the back upright. Once you feel a stretch at the front of the hip, hold the position for 20-30 seconds. Repeat 3-5 times and do this at least 3 times a day. The stretch on the rectus femoris and other quadriceps muscles can be increased by lifting the foot upwards, although avoid this if pressure on the knee causes pain. Use a padded cushion if necessary. Isometric or static contractions involve contracting the muscle without any movement of the leg. This can be done in standing or sitting with the legs out straight. Hold contractions for 10 seconds at a time. Relax for 5 seconds before repeating and perform 10 repetitions. As your strength improves, increase sets to 2 or 3 sets of 10 reps.
Squats can be performed in many ways including ball squats, double leg squats and single leg squats. Fit ball squats are the easiest and so if possible should be performed first, followed by double leg and then single leg as progressions. Ensure you do not bend your knees past 90 degrees and you make sure your knees don’t move forwards past your toes. Start with 2 sets of 10 reps and gradually increase to 3 sets of 15 before progressing.